Hedy Lamarr is a beautiful, highly athletic Verband Premium and States Premium mare currently on lease to Sovereign Farm. Hedy was approved with an impressive 57 points at her inspection and completed her mare performance test with good marks. 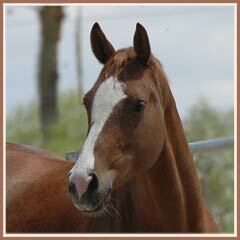 Hedy Lamarr's 2007 filly Honey is available for sale! The following bloodline information was provided by Dr. M Engelhardt for Trakehners International, LLC. Hedy Lamarr's sire Farinelli was the Champion stallion in Neumünster in 1996, and successfully competed at S level in dressage in Europe. 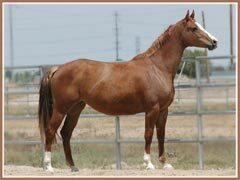 He is a full brother to the 1999 NMS Champion stallion Freudenfest. Dam sire Amadeus was also champion in NMS (in 1977) and was bought at auction by famous Gestüt Hörstein, where he stood at stud for his entire career. It is the dam line of Farinelli that brings in tremendous potential: the third dam Friedericke III was a full sister to the major sire Flaneur, and this family has further produced such stallions as Feingeist, Falkensee, Fasolt, Fahnentäger II, Mahdi, Falkner, and Flugwind. The list of performance horses at FEI levels in show jumping and dressage is very long; as is the list of important brood mares out of this particular family, known as the O102A3 Flocke IV line. Farinelli’s sire Tolstoi was a premium stallion in NMS. 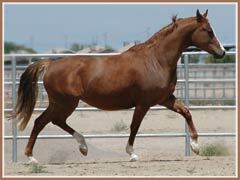 His sire Kostolany is one of the most successful sport horse sires worldwide. In 2006, no less than three of his descendants were listed in the Top Ten of the WBFSH ranking: his approved son EH Gribaldi, Gribaldi’s KWPN approved son Painted Black, and Danish superstar Matine by Silvermoon, another premium son of Kostolany. Tolstoi’s dam E.St. Tugend III is no less impressive: her daughter Titania II produced the approved German Trakehner Tycoon (not to be mistaken with the ATA approved Tycoon). His offspring compete at S level in eventing and show jumping, and he is the dam sire of the Champion stallion Le Rouge and the Res Champion stallion C’est Bon. Tugend’s daughter Turandot IV is the dam of the approved Turnus. Tugend III is also dam of the German approved Topas II, who was exported to North America and sired a Model mare for the ATA as well as good performance horses. Tugend’s get Tiflis and Trenk Quattro were successful at advanced levels in competition. This exceptional mare came from a smaller East Prussian mare family (O70A Tenia), which also stands for the stallions Turmfalk, Trait d’Union and most importantly, the outstanding Tümmler. Hedy Lamarr’s dam Hellandica by the very important dressage sire EH Anduc has had several full siblings by Farinelli. The gelding Hellandros is a successful 3rd level dressage horse in Germany and also participated in the show jumper program of the Trakehner Verband. 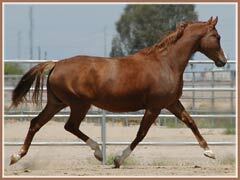 Anduc, who died rather young at age 15, is one of the breed’s most important dressage sires. Among his approved sons is the FEI and elite stallion Angard (with offspring competing at Grand Prix), the now North American-based FEI dressage stallion Schiffon, the 100 day test champion Solonel, the premium stallion Scharahnanduc and last but not least the late Le Duc, an exceptional dressage horse and good producer in Europe. Anduc’s sire line via EH Marduc – Halali stands for such horses as EH Herzzauber, EH Lehndorffs, Induc, or EH Solero TSF, to name just a few. The great dressage potential of Hedy Lamarr’s pedigree finds further continuation with Rubin, who brings in an important line breeding to the great Flaneur, and has been known as a sire of FEI dressage horses, not only in the Trakehner breed, but also in the Rhineland breed. 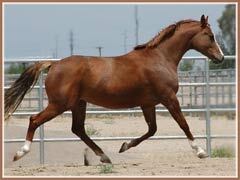 He is the sire of the stallion Majoran in Germany, himself sire of the 1989 NMS champion stallion Preussenprinz; and Rubin also produced the Rhineland approved Rembrandt and the ATA approved Rubinesque. Hedy Lamarr’s dam line of Heidemarie is a smaller East Prussian line that stands for the exceptional dressage stallion Hemmingway.